Japanese bikers fight to resuscitate SPEED TRIBES - gangs infamous for motorcycle antics and modifications. 117 backers pledged $9,010 to help bring this project to life. SAYONARA SPEED TRIBES is the story of HAZUKI, a diehard but aging gangster. 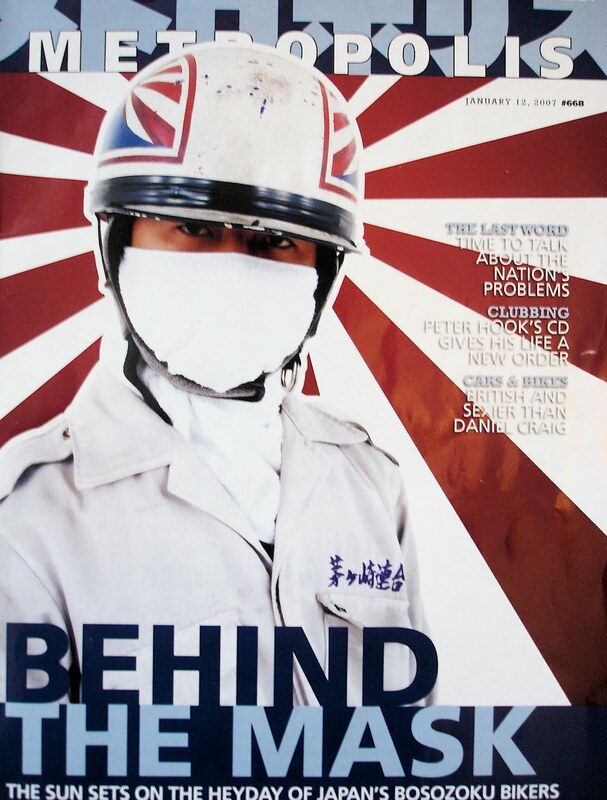 Over the years, and throughout HAZUKI's childhood, the BOSOZOKU (SPEED TRIBES) have reigned supreme as Japan's most infamous ZOKU-subculture or TRIBE. HAZUKI fought and rode his way into BOSOZOKU legend as leader of the infamous Narushino SPECTER a gang which numbered in the ten's of thousands and controlled much of the burbs outside of Tokyo. In Japan, "The nail that sticks out gets hammered down" and as a result, the BOSOZOKU biker numbers have dramatically decreased over the past decade; a very, hard realization for middle aged HAZUKI considering his dwindling options. As an amatuer kickboxer, he stills wears a mock up of his old BOSOZOKU jacket where he competes in matches in an attempt to channel his old glory. Like most BOSOZOKU gangsters HAZUKI is a tough, somewhat clownish outsider pedaling a tough guy image. 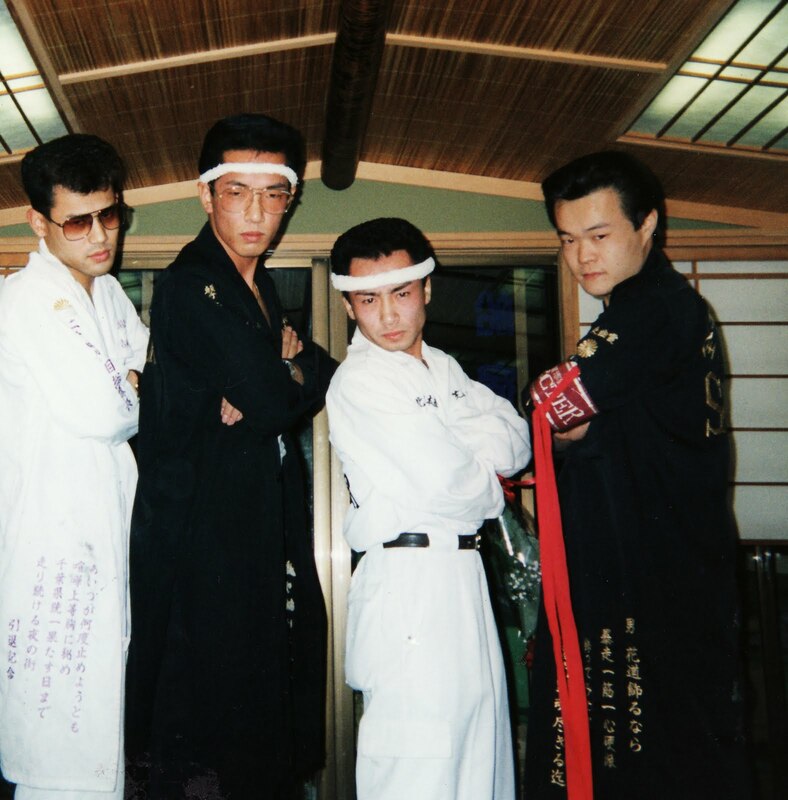 A fanatic about his BOSOZOKU tradition, he mentors BOSOZOKU youngsters in opposition to police and public pressure that is hell bent on ridding Japan of the gangs. As HAZUKI's own gang, SPECTER dwindles in numbers he confronts his past and the future of the BOSOZOKU while carving out his place in some very surprising sectors of Japanese society. The question is, can he turn his back on the glory of his past and his precious gang SPECTER? This film explores BOSOZOKU culture with interviews, bike runs and MANGA-MATION(animated manga comics as seen in the video.) There are some twists and turns as HAZUKI battles his way through life in a documentary that both informs and touches the soul as only an intimate potrait can. SAYONARA SPEED TRIBES opens up deep wounds in Japan's historical treatment of outcasts and the underworld as personified by HAZUKI's story, but at it's heart the film is about the untamed yearning of youth and the aching realization that, for many of us the best days have been left behind. Several years ago, I plundered my bank account, bought mics and cameras, moved to Japan and spent countless hours speaking broken Japanese while dodging motorbikes and cops. Often in life you just have to jump in with both feet! I believe my efforts and those of others, have paid off with stunning footage and interviews from deep inside the heart of the BOSOZOKU scene. Although it is an exciting time, we are at a critical juncture on this project and I can't go any further without funding. For the sake of creative and quality control I've held out on funding from film companies or grants. I have self financed this film because I believe that the BOSOZOKU, although controversial are a unique cross section of Japan and are worthy of being preserved with integrity. FINAL CUT it will truly be a director's vision. Although it takes a team of creative, hard working people to make great films I find truly passionate, independent efforts make for the best films and stand the test of time. Trading off that spirit for a large budget to be doled out and produced by committee just wasn't an option for this kind of project, so I have utilized time, patience and godd old fashioned legwork. Unfortunately the current budget has run out right at a crucial moment. I have discovered some amazing archival footage of the BOSOZOKU from the 70's and employed some talented artists to work on a prototype sequence(SEEN IN THE VIDEO ABOVE) of MANGA-MATION. These elements are the finishing touches I have been looking for and the film is screaming for more! Post-production is well underway but the project CANNOT CONTINUE WITHOUT FUNDS to take film to the next level. 1. Archival footage and music rights. 2. Creation of 2 or 3 manga-mation sequences. 3. Premier screenings in L.A, TOKYO (hopefully more based on the level of funding reached). 4. YOUR MERCHANDISE AND REWARDS. With a successful KICKSTARTER campaign I can finally achieve the kind of film that this rare subject requires and that I -and of course many others - have been working passionately towards. 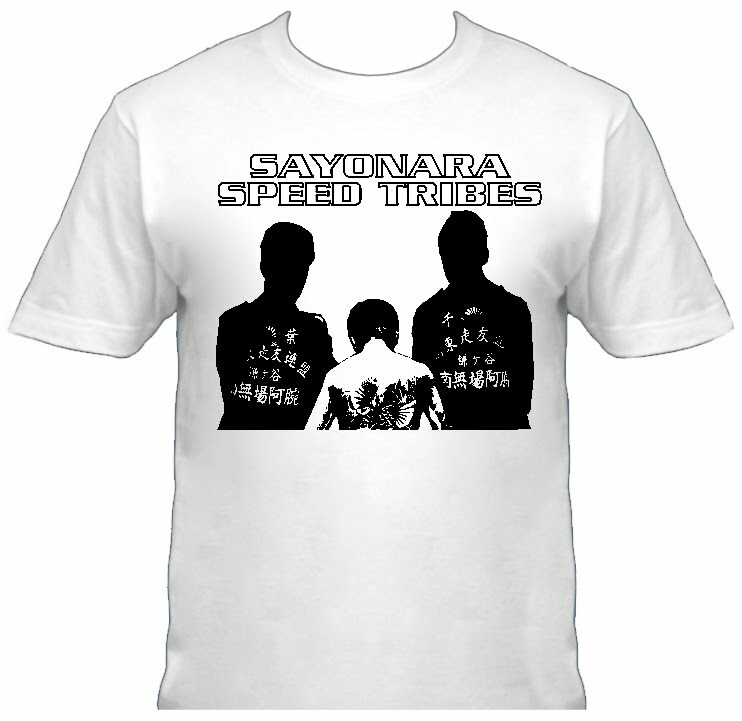 Most of the quality rewards are only available by joining the "Sayonara Speed Tribes" Kickstarter campaign. Please back this project and help me share an exciting and unique part of Japan with the world. www.figure8productions.com for more images and info. PLEASE SHARE THE LINK TO THIS PAGE WITH BIKERS, JAPAN enthusiasts...EVERYONE! Thank you for your interest and if you become a backer, welcome aboard! 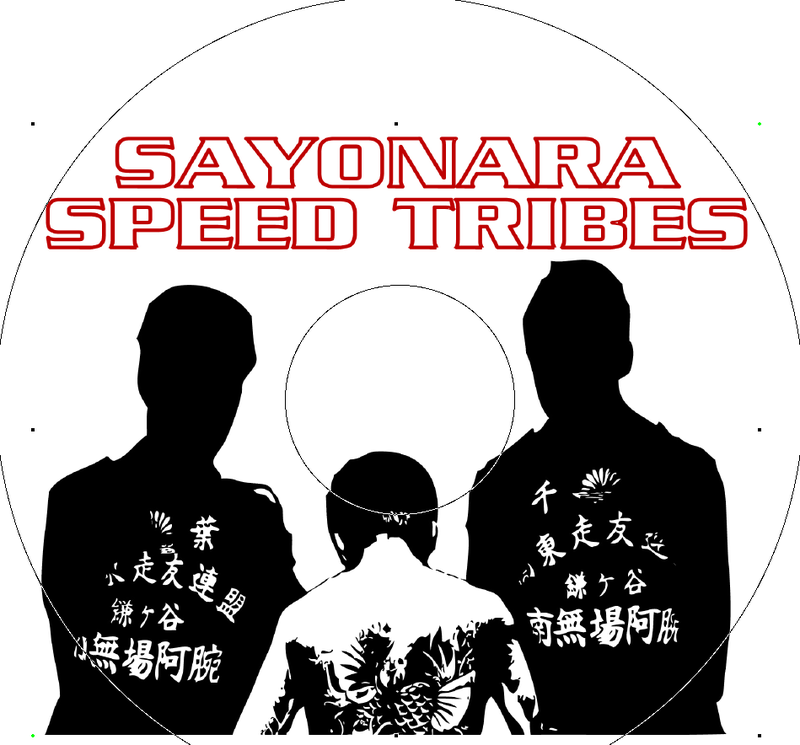 Get the "Sayonara Speed Tribes" DIGITAL PRODUCTION PACK and a link to the KICKSTARTER PREMIER SCREENING . THE "LIMTED FIRST PRINTING DVD FOR KICKSTARTER BACKERS ONLY" PACKAGE ...Of course you get the production photos and online viewing but with this package you get an original DVD cut with extra footage and commentary. We will produce 1000 authenticated original DVDs for our Kickstarter Campaign.
. *If we raise enough cash beyond our goal there will be one in London, and we will add more if possible. Cross those fingers...better yet help us raise the cash to do it! You get all of the above plus YOUR NAME IN THE CREDITS! All of the above plus...A SIGNED COPY OF THE BOSOZOKU PHOTO BOOK 'ZOKU' by Yoshinaga Masayuki (Yoshinaga is the film contributor who took the picture of the helmeted gent and main picture above). Now you get all of the above plus VIP STATUS AT THE SCREENING. VIP means reserved seating, special surprises and merchandise on the day. Jamie Morris the producer/director will personally call you for a big "thank you!" You can talk about anything except the weather; preferably the film or BOSOZOKU. *We will throw in more merchandise (TBA) based on your contribution over $1000, so go higher if you like our swag! Jamie Morris, the producer/director, will come to your town or college and HAND DELIVER THE REWARDS before YOUR PRIVATE SCREENING AND AUDIENCE DISCUSSION SESSION. THIS IS A GREAT OPTION FOR UNIVERSITIES CLASSES ON JAPANESE CULTURE! *please budget for expenses such as Jamie Morris's air travel and lodging plus the screening venue.